Trump meets with coalition of Democrats and Republicans as shutdown drags onTrump meets with coalition of Democrats and Republicans as shutdown drags on originally appeared on abcnews.go.com A bipartisan coalition of lawmakers from the House Problem Solvers Caucus sat down with President Trump at the White House Wednesday as the president continues to demand funding to build a southern border wall as a condition for ending the partial government shutdown, now in its 26th day.The meeting with both Democrats and Republicans comes the day after the president invited a group of rank-and-file Republican and Democrat members to the White House for lunch. No Democrats took the White House up on that invitation, which was viewed on Capitol Hill by some as an attempt by the White House to create fissures within the Democratic Party – though House Speaker Nancy Pelosi gave approval for Democrats to accept Trump’s invitation.Democrats remain united in their firm opposition to building a physical barrier along the southern border and have said they will not negotiate with the president on the issue with the government still partially shuttered.Talks between President Trump and Democratic congressional leaders broke down a week ago when Trump walked out of a meeting with top Democrats after Pelosi told the president she would not be willing to cede to the president’s demand for wall funding if the government reopened.The seven Democrats who attended Wednesday’s meeting released a statement as they arrived at the White House saying they accepted the president’s invitation in order to relay their message that the government must be reopened as a precondition for further in-earnest conversations.”There is strong agreement across the aisle and around the country: We must reopen the government. Our security, safety, and economy have been compromised, and millions of families are suffering,” the Democrats said in a group statement. „There is also strong agreement that if we reopen the government, the possibility exists to work together and find common ground to tackle some of our country’s toughest problems and fix them. But that conversation can only begin in earnest once the government is reopened.”The Democrats included Reps. Josh Gottheimer, Thomas Suozzi, Vincente Gonzalez, Anthony Brindisi, Dean Phillips, Max Rose, and Abigail Spanberger.While President Trump remains dug in with his demand for $5.7 billion in funding for a southern barrier, the White House has acknowledged that the administration’s updated projection of the impact of the partial government shutdown on economic growth has worsened. 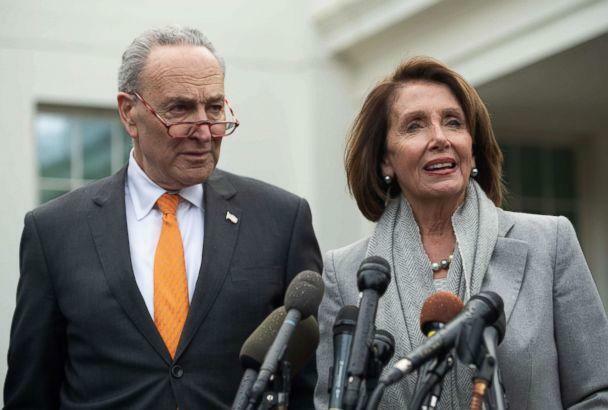 PHOTO: Senate Democratic Leader Chuck Schumer and Speaker of the House Nancy Pelosi talk to the media following a meeting with President Donald Trump about the partial government shutdown at the White House, Jan. 9, 2019. 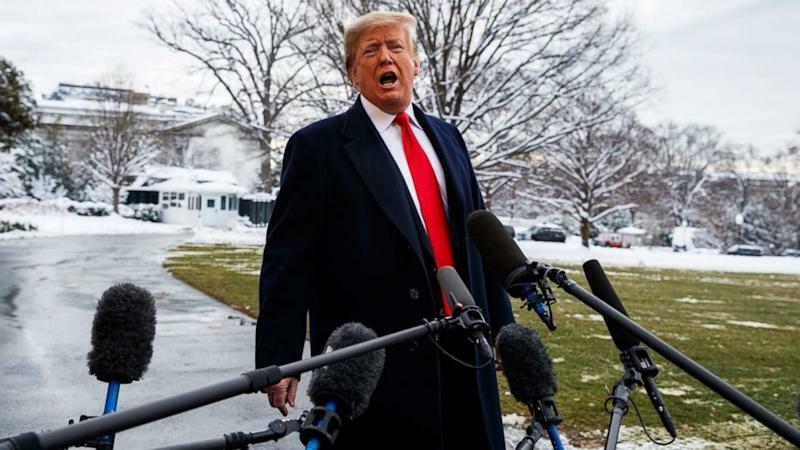 (Saul Loeb/AFP/Getty The administration’s updated projection estimates the ongoing shutdown shaves off 0.13 percentage points each week off quarterly economic growth.The administration’s revised model includes both the estimated impact from those contractors that are not working because of the shutdown, as well as the 380,000 furloughed federal workers, according to an administration official.White House Press Secretary Sarah Sanders downplayed concerns about the negative impact of the ongoing stalemate on the economy, maintaining that the White House remains confident in the long term fundamentals of the economy and the president’s policies.Rank-and-file Democrats snub White House invite to meet with Trump amid shutdownAnd while President Trump said Monday that he rejected a proposal from his close ally South Carolina Republican Sen. Lindsey Graham to reopen the government on a short term basis to allow for time to negotiate, Graham said Tuesday night that he and a bipartisan group of senators were preparing to make a pitch to the president to do just that. Senior Editor,Yahoo News• January 16, 2019 President Trump has claimed repeatedly that most federal workers support his tactic of shutting down the government to enforce his demand for a border wall — including those directly affected by it. But a new poll of government employees shows that few actually do.According to the survey conducted by the Government Business Council and GovExec.com and released Tuesday, 71 percent of federal workers oppose the shutdown, compared to just 21 percent who support it. Just 34 percent of federal employees surveyed support Trump’s demand for funding for the wall, while 56 percent oppose it. And of those workers against the wall, more than 80 percent say they are strongly opposed to it. Amid the longest government shutdown in U.S. history, most federal workers say they oppose President Trump’s demand for border wall funding. (Photo: Leah Millis/Reuters)Meanwhile, a pair of recent national polls show most Americans blame the president for the shutdown. According to a CNN survey released Monday, 56 percent of Americans oppose a border wall, while 39 percent favor one. And according to a PBS NewsHour/Marist poll released Wednesday, 54 percent say Trump is to blame for the impasse, while 31 percent put the blame on Democrats in Congress. (Five percent of those polled blame congressional Republicans.) And more than 70 percent believe shutting down the government in order to reach an agreement on policy is a bad strategy, compared to just 22 percent who do.Among those who consider the strategy flawed: 35 percent of Republicans.Trump is demanding Congress allocate $5.7 billion that would go toward construction of a physical barrier on the U.S. border with Mexico in exchange for reopening the government. Democrats are refusing to do so, and want the government reopened while negotiations continue. President Trump tours the southern border in McAllen, Texas, on Jan. 10. (Photo: Evan Vucci/AP)The shutdown, now in its 26th day, is the longest in U.S. history. About 800,000 federal employees have been affected. Approximately half of those are continuing to work without pay, although they are likely to receive back pay after a budget is passed. The rest are furloughed.For the first time ever, a funding impasse is affecting active-duty military personnel.On Tuesday, U.S. Coast Guard Commander Adm. Karl Schultz advised more than 40,000 active duty members that they would not be receiving their regularly scheduled mid-month paycheck. 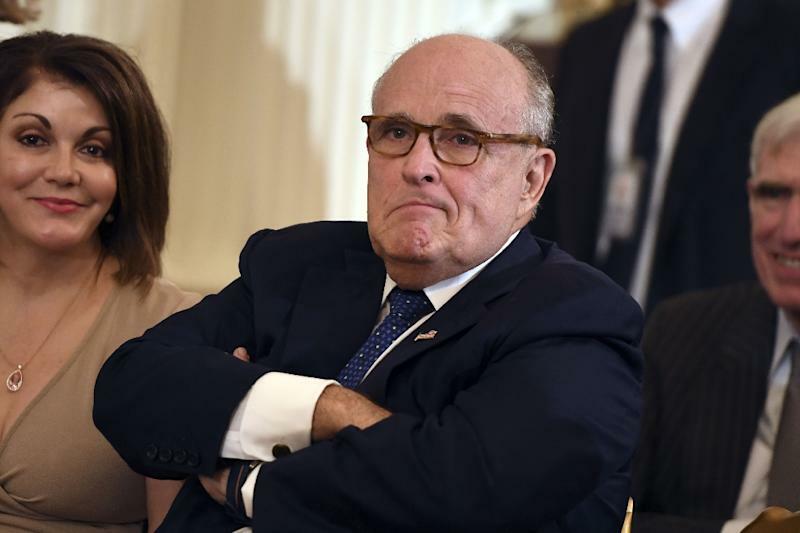 Giuliani: ‘I never said there was no collusion’ with Russia AFP• January 17, 2019 Rudy Giuliani insisted Donald Trump was not involved in any collusion with Russia during the 2016 presidential election campaign (AFP Photo/SAUL LOEB)Washington (AFP) – US President Donald Trump’s personal attorney, Rudy Giuliani, on Wednesday insisted he „never said there was no collusion” between Trump’s 2016 presidential election campaign and Russia — only that Trump himself was not involved.Speaking to CNN’s Chris Cuomo, the former New York mayor said he did not know if others involved in the campaign had worked with Russia.”I never said there was no collusion between the campaign, or between people in the campaign,” Giuliani said.”I said the President of the United States,” he added.”There is not a single bit of evidence the President of the United States committed the only crime you can commit here, conspiring with the Russians to hack the DNC.”A day earlier, Trump had insisted he „never worked for Russia” following two bombshell reports.”It’s a disgrace that you even ask that question,” he told reporters on the White House’s South Lawn. „It’s all a big fat hoax.”In the first report, The New York Times said the FBI opened an investigation into whether Trump was acting on Russia’s behalf soon after he became president.Meanwhile, The Washington Post detailed what it said were the unusual lengths taken by Trump to hide the contents of his conversations with Russian President Vladimir Putin.Both men’s comments come as Special Counsel Robert Mueller’s investigation looms large in the background, punctuated by guilty pleas, convictions and indictments of former Trump associates.These include his former national security advisor Michael Flynn, former Trump campaign chief Paul Manafort and Trump’s former personal lawyer Michael Cohen.Manafort has admitted to sharing polling data with a Russian during the 2016 presidential race, according to a court filing inadvertently made public by his lawyers. CNN reported that the intended recipients were two pro-Russia Ukrainian oligarchs.But on Wednesday, Giuliani suggested that was „not collusion”.”Polling data is given to everybody,” he told CNN. 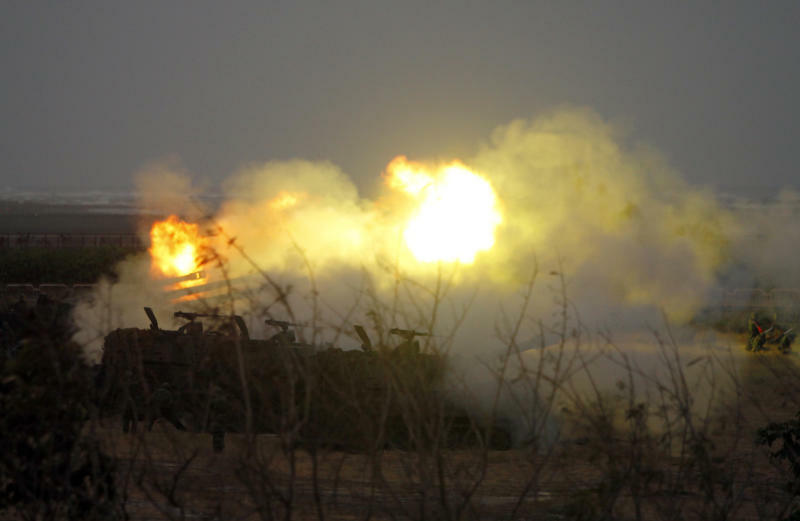 Taiwan holds live-fire exercises following China threats Associated Press• January 17, 2019 M110A2 self-propelled howitzers fire during a military exercises in Taichung, central Taiwan, Thursday, Jan. 17, 2019. Taiwan’s military has conducted a live-fire drill on Thursday to show its determination to defend itself from Chinese threats. 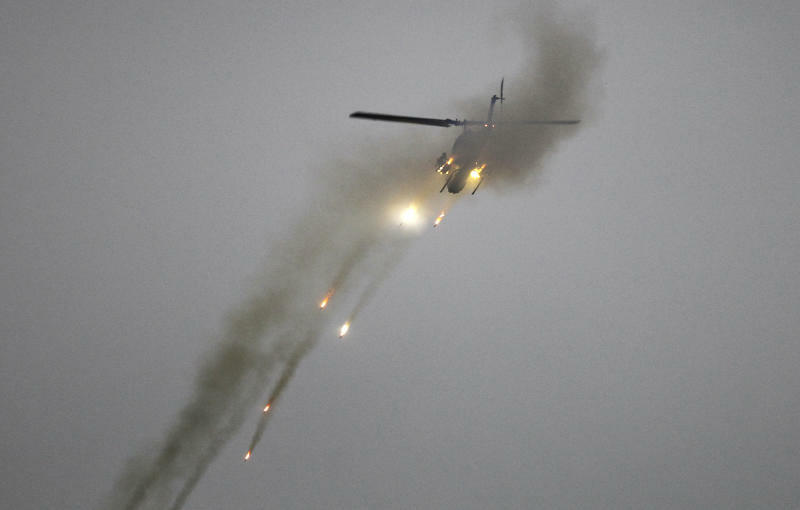 (AP Photo/Chiang Ying-ying)HSINCHU, Taiwan (AP) — Taiwan is holding live-fire military exercises following extended threats against the island by China.Artillery and assault helicopters fired at targets off the west coast city of Taichung on Thursday, while Mirage fighter jets took off amid rainy conditions from the air base at Hsinchu to the north.The drills are Taiwan’s first since Chinese President Xi Jinping on Jan. 2 reasserted Beijing’s willingness to use military force to bring self-ruling Taiwan under Chinese control.The drills also follow a new Pentagon report laying out U.S. concerns about China’s growing military might, underscoring worries about a possible attack against Taiwan.Taiwan’s independence-leaning President Tsai Ing-wen has made national defense a priority and has refused China’s demand that she recognize Taiwan as a part of China. World Will May Survive Her Brexit Defeat? Madeleine Kearns,The National Review• January 16, 2019 The only meaningful unity that the United Kingdom has seen in the past two years has been opposition to the Brexit deal Prime Minister Theresa May negotiated with the European Union. That agreement, as predicted, suffered a crushing blow in the House of Commons today, voted down by a 432-to-202 margin in what was instantly the worst parliamentary defeat in history. The defeat, as predicted, has prompted Labour leader Jeremy Corbyn to propose a vote, expected to be held on Wednesday, of no confidence in the government. When future historians consider Brexit, they will surely marvel at May’s obstinate capacity for survival in the face of unending political humiliation. Though her authority is all but nil at this point, if she hangs on tomorrow, her leadership will be further cemented. What doesn’t kill me makes me stronger, though it still doesn’t bring me Brexit . . .May’s final plea before the defeat was that “a vote against this deal is a vote for nothing more than uncertainty, division, and the very real risk of no deal,” or worse, “no Brexit at all.” Which is true. Labour is just as split as the Tories on the question of how to proceed. Corbyn now faces enormous pressure from his own back-benchers to back a second referendum, and has shown no sign at any point of having an alternative to May’s deal in mind.That is because there were only ever two alternatives to May’s deal, as the EU saw it: no-deal Brexit (which they deem disastrous) or no Brexit at all (which they’d quite like). For the British people, the choice was simpler still — faith in Brexit or no faith in Brexit. Now it seems that Britain faces two distinct but inexorably linked crises: a crisis of government and a crisis of legitimacy. Should both crises collide, it is hard to imagine the havoc that would ensue.Indeed, while it was one thing for Conservative MPs to vote against the prime minister in a Tory-party confidence vote (which May narrowly won), it would be quite another for Conservative MPs to vote with Corbyn in order to bring down a Tory government. Doing so, even as an attempt to prevent a no-deal Brexit, would be political suicide. Yet it is this desperation that Corbyn is banking on.It appears that there is a majority in the Commons set on blocking a no-deal Brexit. That much became clear when the speaker of the House tabled an amendment last week that will force May to return to the Commons within three days of her defeat and present an alternative plan. Of course, that doesn’t necessarily translate into opposition to the government.Meanwhile, the Northern Irish Democratic Unionist party, on whom the Conservative government relies for its majority, has already promised to back the government in tomorrow’s vote. The DUP would be content with no-deal Brexit, as it would mean the end of the proposed arrangement whereby the U.K. would remain in the European customs union indefinitely in order to prevent a hard border with Ireland.Clearly the only way to stop a no-deal Brexit is to put something — or someone —else in its place. What or who might that be? 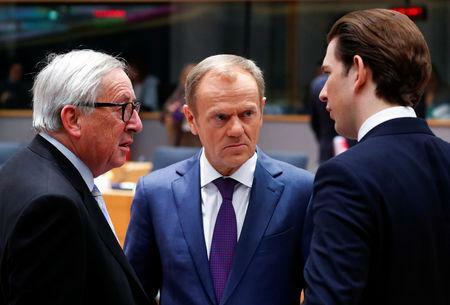 Though the EU has said previously that it will not budge on the terms of the deal negotiated by May, its bluff is about to be called. 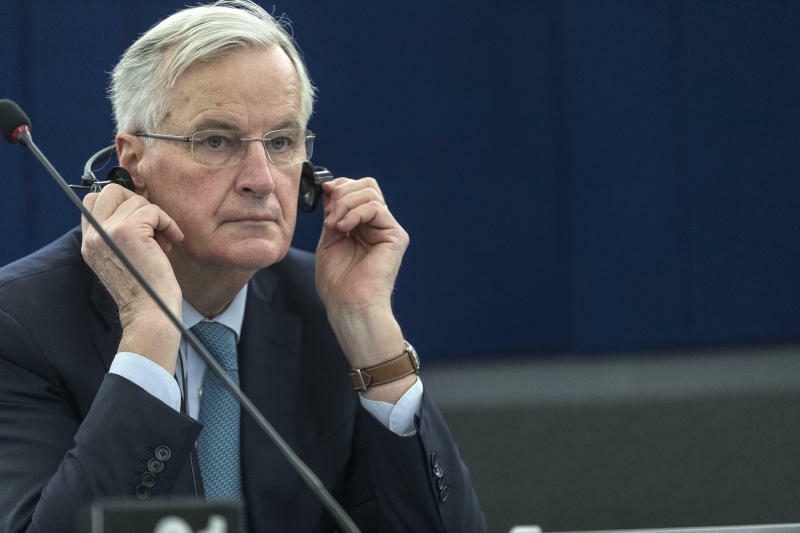 No-deal Brexit is not in Europe’s interests, and so the EU may push for a softer Brexit by permitting the “extension” or revocation of Article 50, which currently mandates that Britain leave the EU on March 29.At any rate, the question of who governs Britain does not resolve any of the uncertainty or division surrounding Brexit’s implementation. 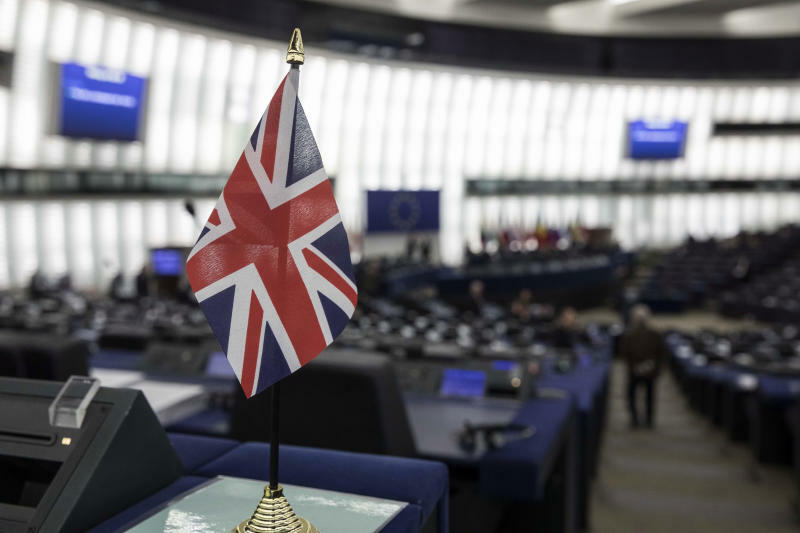 Britons voted to leave the European Union, but two years later none of their representatives in Parliament is any closer to knowing what that would look like. Corbyn argued today that May had reached “the end of the line” after two years of failure. Could this also be true of Brexit? SUVs may rule America’s showrooms, but cars ain’t dead by a long shot. The first day at the 2019 Detroit auto show, whose official name is the North American International Auto Show, saw a dozen new vehicles, ranging from the revival of a beloved sport coupe to a major move upscale for Kia’s SUV lineup. Media crowd around the all-new 2020 Mustang Shelby GT 500 during the 2019 North American International Auto Show held at Cobo Center in downtown Detroit on Monday, Jan. 14, 2019. Toyota unveils the 2020 GR Supra during the 2019 North American International Auto Show held at Cobo Center in downtown Detroit on Monday, Jan. 14, 2019. Infiniti QX Inspiration during the 2019 North American International Auto Show held at Cobo Center in downtown Detroit on Monday, Jan. 14, 2019.